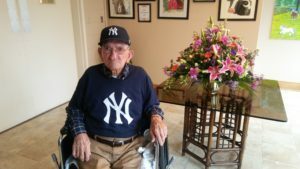 Milt Capps a 99 year-old resident at Smithfield Manor, is hoping to see the New York Yankees play in Yankee Stadium this June for his 100th birthday. A 99 year-old Johnston County man is looking forward to his 100th birthday this summer. 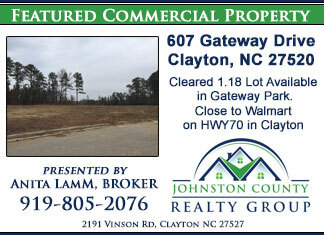 William Milton “Milt” Capps grew up in the Brogden community east of Smithfield. Milt worked all his life. He started out as a tenant farmer and later worked in construction, helping build bridges and high rise buildings. 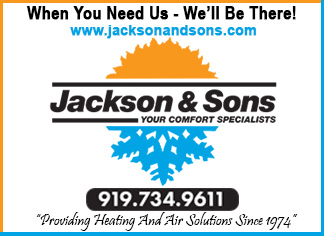 While working on a building in Wake County he fell 6 stories down an elevator shaft, survived, and went back to work on the same building as soon as he was out of the hospital. He also worked 22 years on the Billy Stephenson Hog Farm. When he wasn’t working long hours, he helped his wife raise their son and daughter. At night he would turn on the radio and listen to his favorite team, the New York Yankees. Milt loved Mickey Mantle, Joe DiMaggio and Yogi Berra. A couple of times Milt traveled to Washington DC and Baltimore to watch the Yankees play. His goal was to always see his favorite team play in Yankee Stadium but because of work and family obligations he could never find the time to travel to New York. Milt retired at the young age of 81. His wife passed away in 2006. Last year, he became a resident at Smithfield Manor on Berkshire Road. 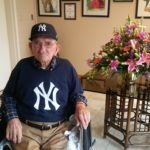 He would always dress up in a Yankees shirt, ball cap or other memorabilia and share with staff and fellow residents stories about the Yankees. One of the staff members at Smithfield Manor, Jodi Desimone was also a Yankee fan. She grew up in Syracuse, NY and moved to North Carolina 8 years ago. Jodi and Milt would often exchange stories and game scores. Milt recently confided in Jodi that he had one regret in his life. He had never seen the Yankees play in their own stadium. 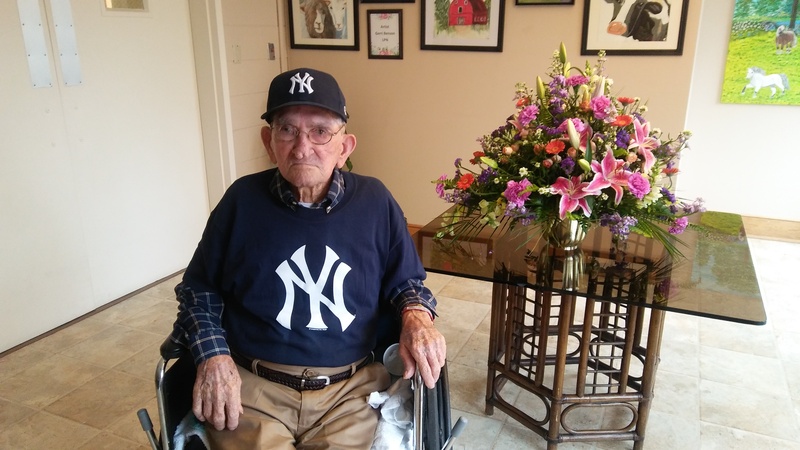 Jodi shared the story with co-worker, Donnie Wood, and together they have launched a GoFundMe page to raise $3,000 to help sent Milt, two medical staff, and a family member to Yankee Stadium for his 100th birthday this June. “I’ve always loved watching baseball,” Milt told WTSB on Thursday at Smithfield Manor. “I watched the Smithfield and Selma baseball teams play, teams in the Tobacco State League.” But watching professional baseball was his real joy. “Joe D (DiMaggio) was my idol. I’ve seen Phil Rizzuto, Yogi Berra and Mickey Mantle.” But never in Yankee Stadium. Milt was also an avid listener of Carl Lamm on WTSB and WMPM Radio in Smithfield. He enjoyed Carl talk about his visits to Yankee Stadium and the players he met, dreaming one day he could make the same trip. With the permission of Smithfield Manor, Jodi and Donnie are conducting the fundraiser outside of work. Their goal is to raise $3,000 as soon as possible so they can plan Milt’s trip and fulfill the one goal, the one dream he has always had. Jodi Desimone and Donnie Wood are helping raise $3,000 for Milt Capps to travel to Yankee Stadium for his 100th Birthday this June. A GoFundMe account has been established to help pay for the trip. Donnie is holding a Derek Jeter plaque presented to Milt from WTSB’s Carl Lamm, who is also a big Yankees fan. 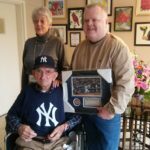 If you would like to help Milt attend a game at Yankee Stadium this summer for his 100th birthday, click here to donate on his GoFundMe account. 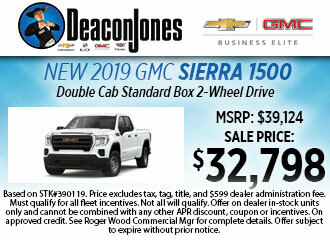 For questions you can call Jodi Desimone at 919-934-3171 Extension 227. 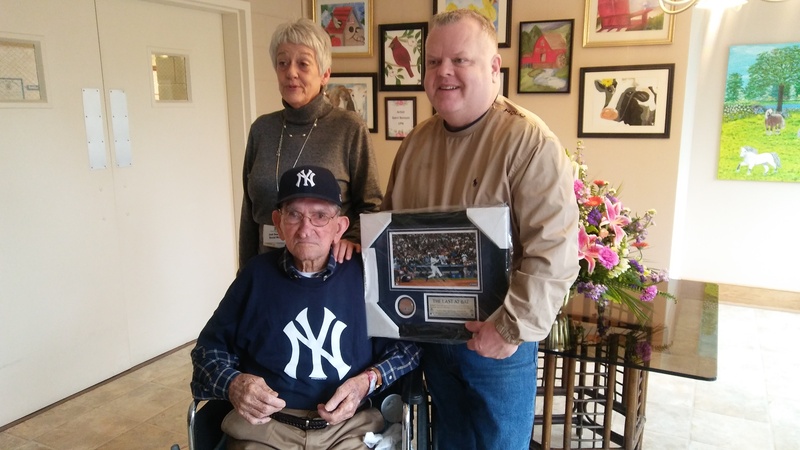 While interviewing Milt on Thursday, Mickey Lamm from WTSB Radio presented Milt with a gift from Carl Lamm, a framed photo of retired Yankee Derek Jeter taking his last at bat. The plaque also included a capsule of dirt from Yankee Stadium. Hopefully Mr. Milt you will be standing on the dirt in Yankee Stadium this June for your 100th Birthday! 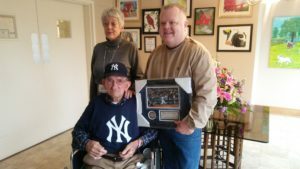 We did reach out to the New York Yankees to share Milt’s story. 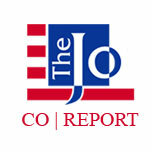 As of our news deadline we had not heard back from the organization.